Ice Bucket Challenge ALS and Lyme Disease? Posted August 21, 2014. 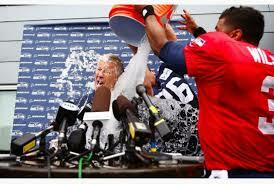 With the ice bucket challenge all the rage now by major sports stars to raise money for ALS (Amyotrophic Lateral Sclerosis or Lou Gehrig’s Disease), I am wondering about the purported connection between Lyme disease and ALS. There are some interesting articles which connect the two. The bottom line is this: if you have Lyme symptoms and Lyme disease, get treated! And be aggressive about your Lyme disease treatment. If there is an eventual connection between Lyme disease and ALS, you don’t want to be the next victim. Although I don’t think it has been proven yet definitively that there is a connection between Lyme disease and ALS, I can see similar deterioration of the body in extreme cases of Lyme disease. Take your doctor’s orders seriously. Take your medications until the job is done. This entry was posted in Lyme Symptoms and tagged Misdiagnosis. Bookmark the permalink.